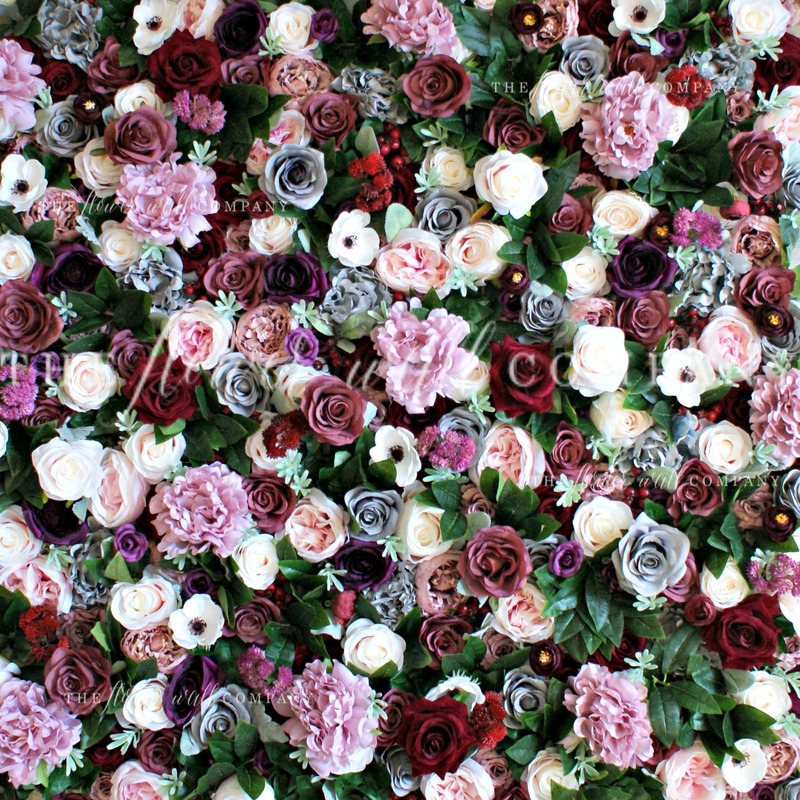 Wow – the past two months have seen a huge increase in love for our Value Range Flower Walls! We launched the new designs back in the beginning of summer, and as with any new product it can take a while for news to spread worldwide to the flower wall buyers, but now it has and we are seeing orders coming in from across the globe. 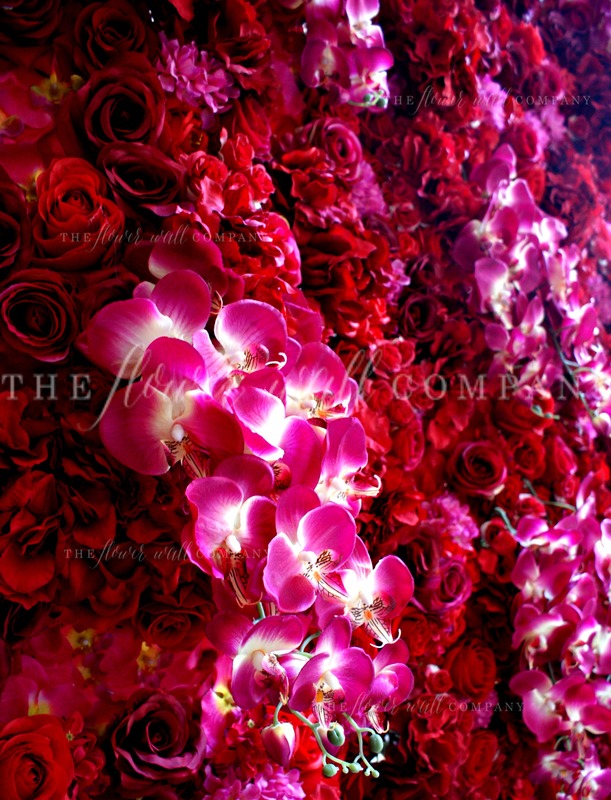 We love flower walls, and happen to think we are quite the experts at creating jaw dropping backdrops, but one thing we kept seeing was the word ‘luxury’ being applied to walls of all qualities from other manufacturers when in our view they are anything but that – and as we are huge supporters and believers of honesty and integrity, we decided to do something about it. What we have created in our Value Range, still stands head and shoulders above supposed luxury walls you can seek out with other companies. They are still hand built in our workshop by our small team, still created with the high standards we demand, and, still look a million times more WOW than most other walls on the market at the same price. We decided to create three walls that have ever so slightly different tones, but these are hot, in demand colors! We focused the three tones: Pink, Peach, and Dusky Pink. What all three walls have however is blush and creams, the two colors that will never go out of style. 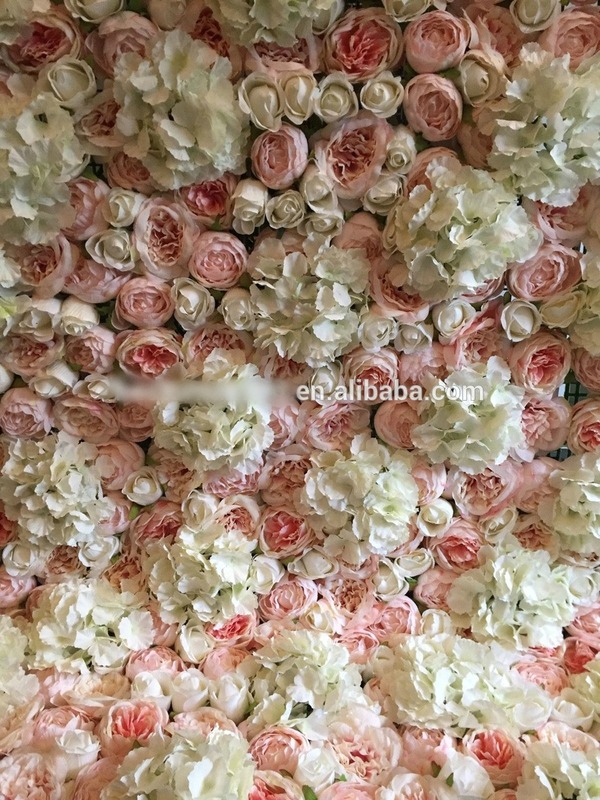 We want to create gorgeous flower walls for everyone no matter the budget, which is why a 1.8m x 2.4m floral backdrop like above starts at 895USD including international shipping. 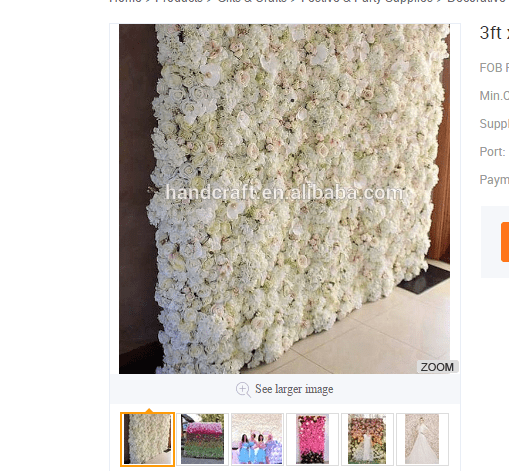 Perfect for a bride who wants a wall to keep for their wedding, or someone looking to start up a flower wall business before moving on to the more lifelike, 3D designs we are known for. Our Value Flower Walls are still created to the same high standard – no gaping, no low end blooms, no unwanted surprises when you open your delivery. The images you see are of the walls you will be receiving! 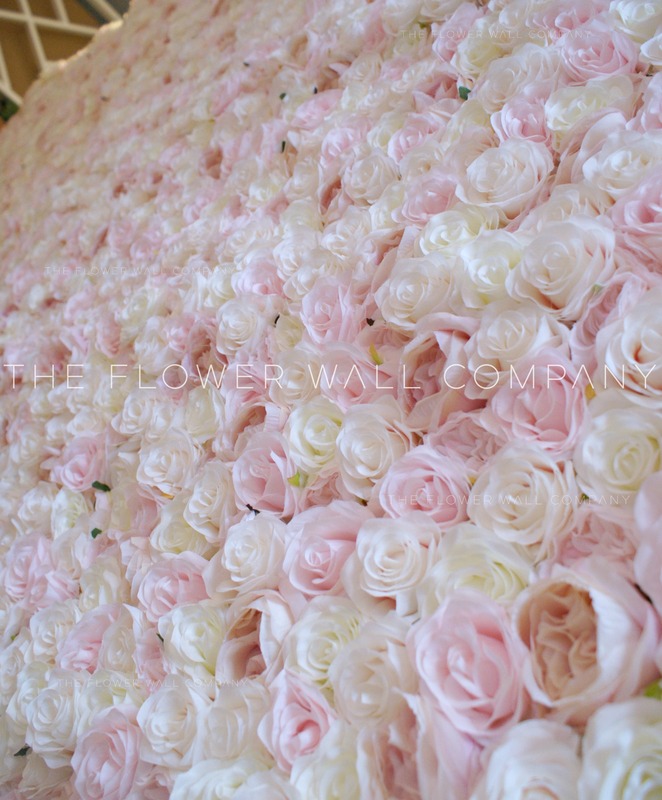 Currently, we have over 12m of Value Flower Range Walls to create, in addition to our other flower wall and floral backdrop orders, so the next few weeks will be super busy for us! 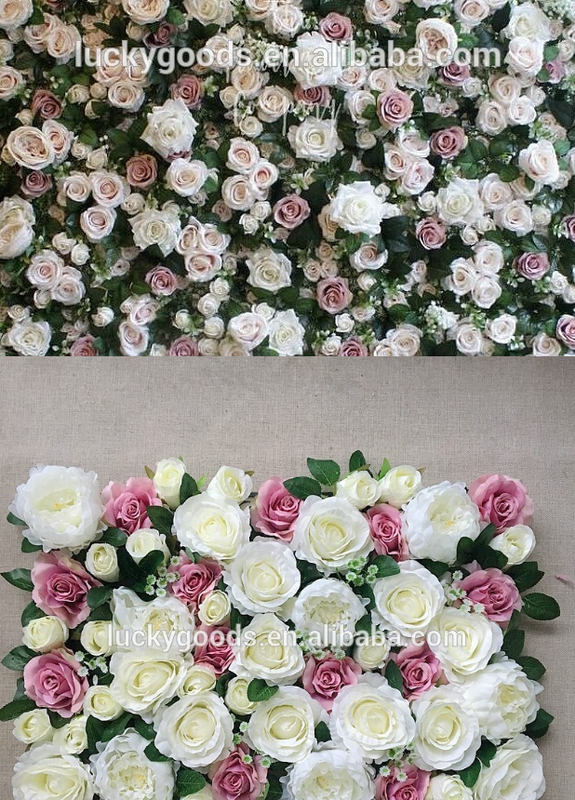 But we don’t mind, we are happy we are seeing an increase in new and repeat customers choosing quality floral backdrops. To view our Value Range, click here, or email us for more information! 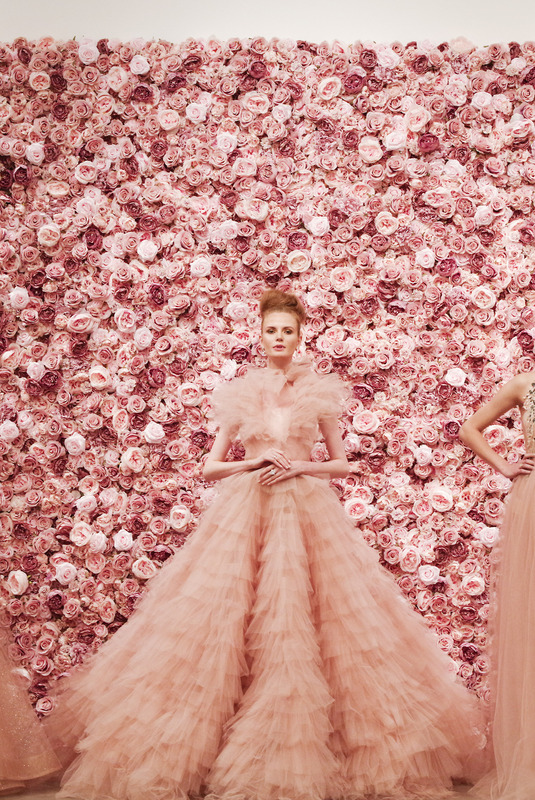 You’ve probably seen the images already of two of our gorgeous flower walls at New York Fashion Week! 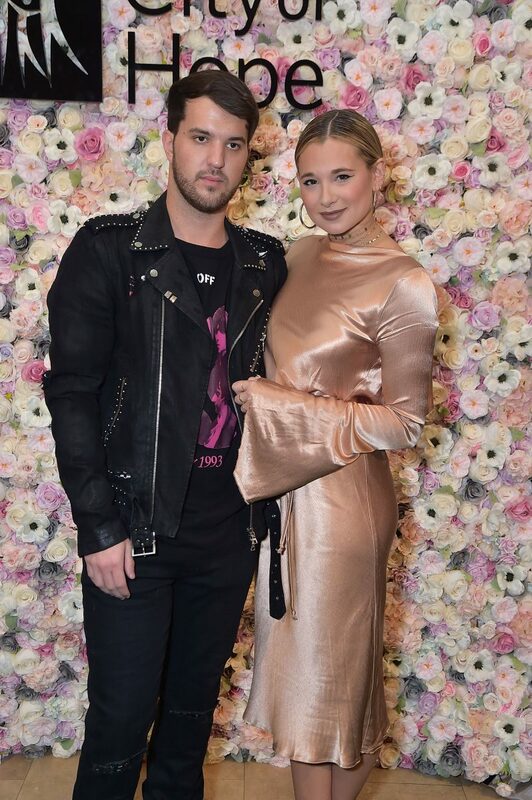 We are so proud to have supplied the floral backdrops for Michael Costello’s SS18 Presentation and we couldn’t have imagined just how much impact the walls would have. 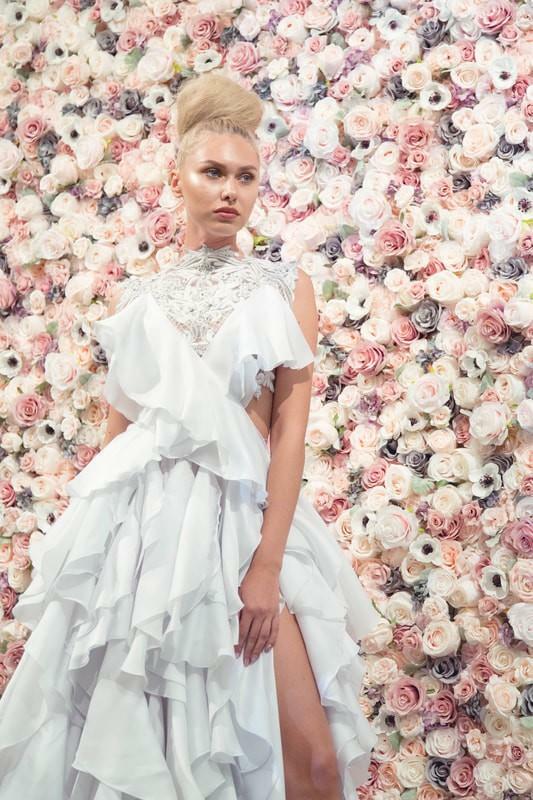 At the Robert Miller Gallery in fashionable Chelsea, we had a blank canvas to help Michael create his vision of “The Secret Garden”, where humanity and nature entwine, and the idea of beauty is empowered by whimsical elements of organza and sparkle. The delicate colors of the dresses were effortlessly matched and enhanced by two of our flower walls – one of our most popular designs, The Petra, and one of our new Fall/Winter walls, Miss Edwards. Each wall was 3m tall and 3.6m wide (around 10ft x 12ft) and mounted to the gallery wall – a perfect example of why we don’t create self-supporting walls! More often than not our client base is production/events companies and commercials businesses who don’t need a wall that stands up on its own. The flexible nature of the panel system that we first implemented means you can use the walls for the best fit at your event without being tied to a cumbersome frame or backing system. We knew when we created this design almost six months ago that it was something special, and that we would be seeing the copies of our walls featuring anemone flowers, and we were right! We don’t mind being industry leaders – someone has to set those trends and it might as well be us! Watch this space for more walls popping up featuring anemones! To the untrained eye this might look just like any other Petra Flower Wall but to us in the know it’s actually a slightly different, custom Petra Flower Wall. We have used a higher grade of anemone flower – with real touch feel, as well as adding in real touch blush flower heads. The quality of the anemone’s is amazing and we will be using them in the future for this design – that’s what we are all about! 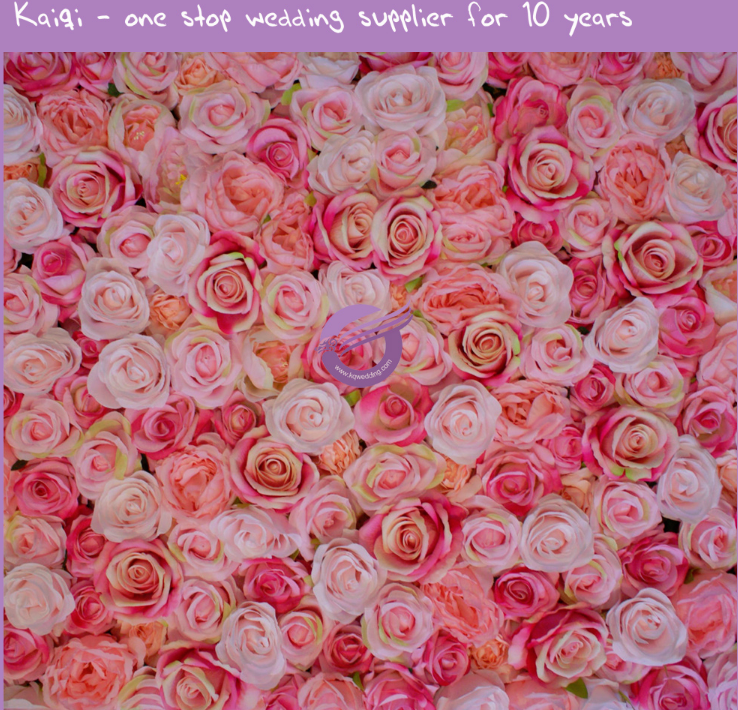 We are getting flowers made and pushing suppliers to create better, more realistic flowers. We think the Petra Flower Wall was a perfect choice for Michael’s presentation as it perfectly complements the ethereal and magical theme of his gowns. It’s always been a strong choice for luxe minded clients and very unique in its appearance. 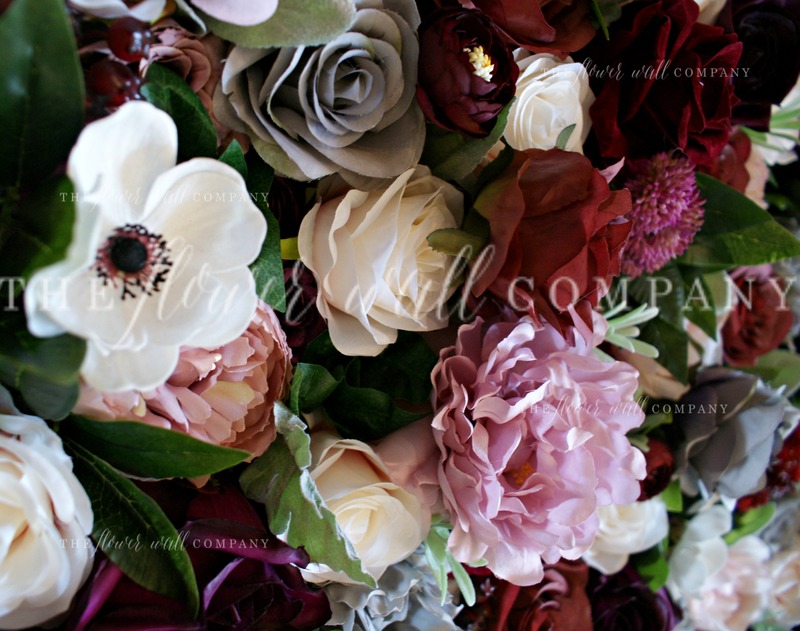 A new comer to The Flower Wall Company, we specifically designed Miss Edwards for our Fall/Winter collection as a dusky pink rose as we’ve spotted the color scheme gaining popularity in the past few months, and it seems our intuition was right! We had a good feeling this color scheme would be a popular choice so with that in mind we set about creating a 3D, life like looking wall. It has over 30 different components and each panel has around 120 – 150 flowers for that full on wow. 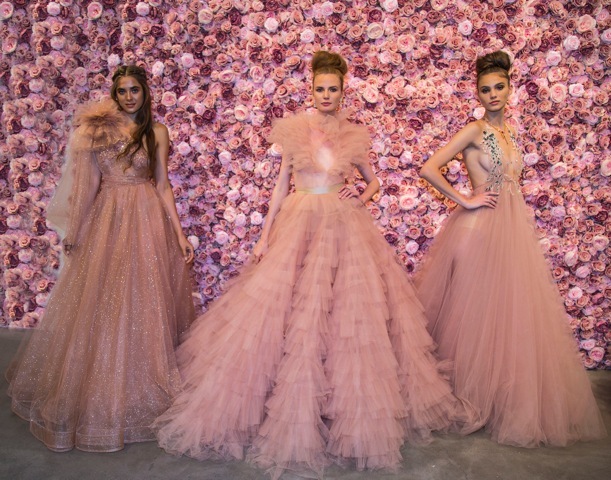 The photos from the presentation are absolutely stunning and we just cannot believe how perfect they look with Michael’s dusky rose & blush colored couture gowns. The response and social sharing of the images from the event has been nothing short of amazing and we are super honoured and proud to have been part of this event, which rewards our hard work and dedication to creating stunning flower walls. What has made us the choice for designers, brands and commercial properties worldwide is our commitment to a quality product. We don’t mess around with low quality or factory mass production. That’s not our style. What is our style? Total wow. Quality over price. Being original. That’s what keeps our flower walls apart from the others and we will continue to deliver on that promise. 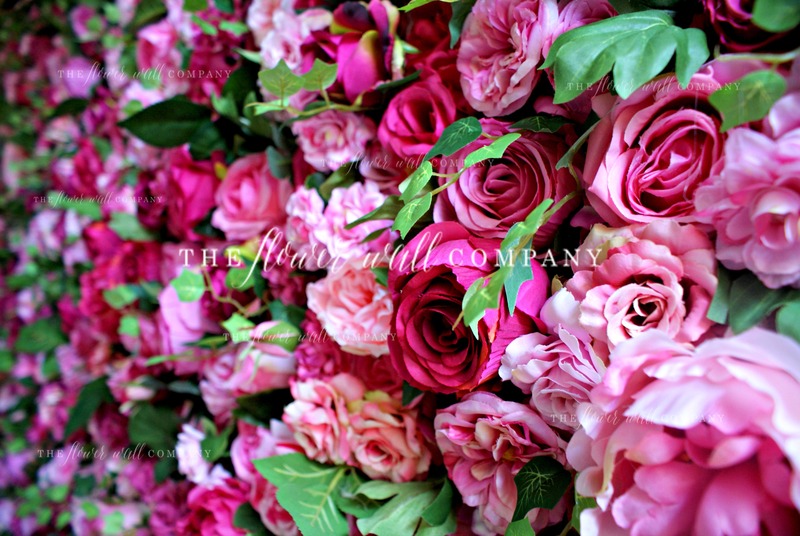 You can purchase both our Petra and Miss Edwards flower walls on our online store in our three most popular sizes, or if like Michael you’d like a custom/bigger size, simply contact us at info@theflowerwallcompany.com. We are often emailed by our lovely clients asking to have some of the images we have taken of our walls without our watermark. We can understand why – people want to start promoting and showing off their gorgeous wall straight away! But we’ve had a policy for a while now that we don’t send out un-watermarked images. So why do we do this? Well, a long time ago when we started making flower walls, we sold them without the logos on, and to be frank, our images got copied and used for other companies benefits. 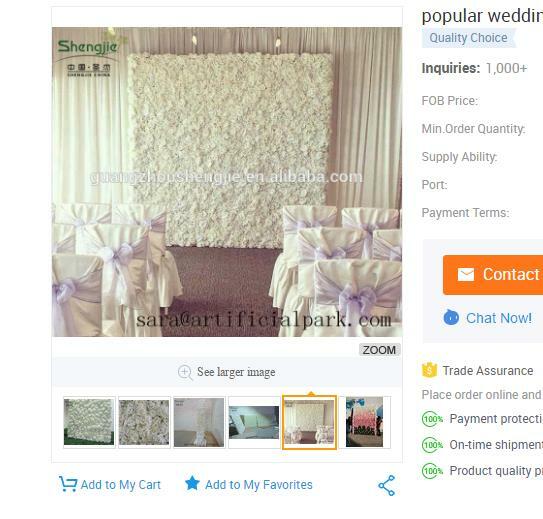 Countless times we have seen our images on Alibaba, other flower wall company websites, photo shopped into to promotional shots and more. Thankfully, since we have become vigilant about watermarking, we don’t tend to see any of our newer stuff out there, but that doesn’t stop people trying! 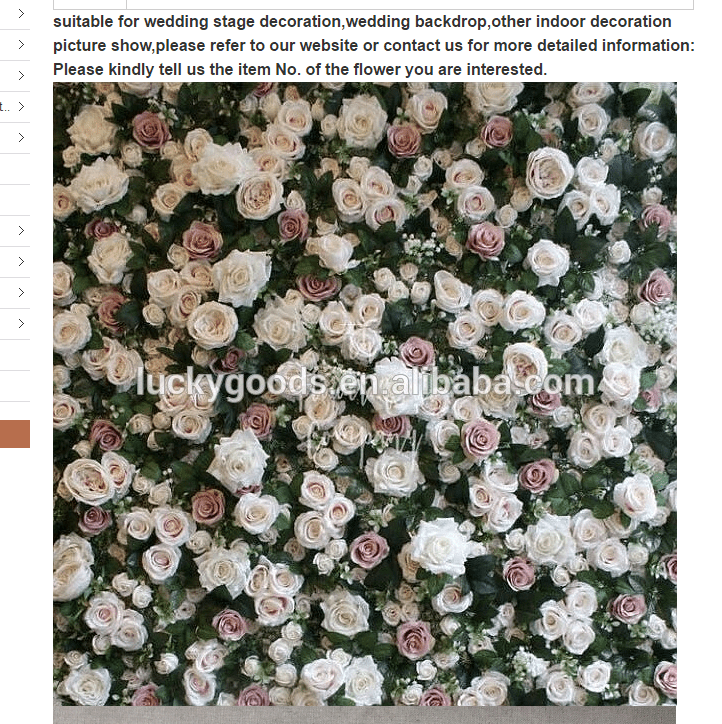 And of course, as it is quite well known that if the images are stolen such as the ones above, the flower wall you receive will not be the same as the image! Of course watermarks can altered and removed, but it’s a lot of more difficult and time consuming to do so, so acts as a fabulous deterrent. These are just some examples of our images have been used – we also see our flower walls from our lovely clients being used by other businesses pretending it is there own. Frequently we see this on Facebook and Instagram so it really pays to watermark your images to protect your work! We can’t control what un-watermarked images customers take of the walls themselves, but we definitely recommend applying a watermark to all your images or you too could find your hard work and design talents being used by other companies pretending it is their own. If you can’t wait to take the images of the wall yourself, we are happy for you to either send us your watermark, or if you don’t have one, we can simply write your company name in a font of your choice across the image! 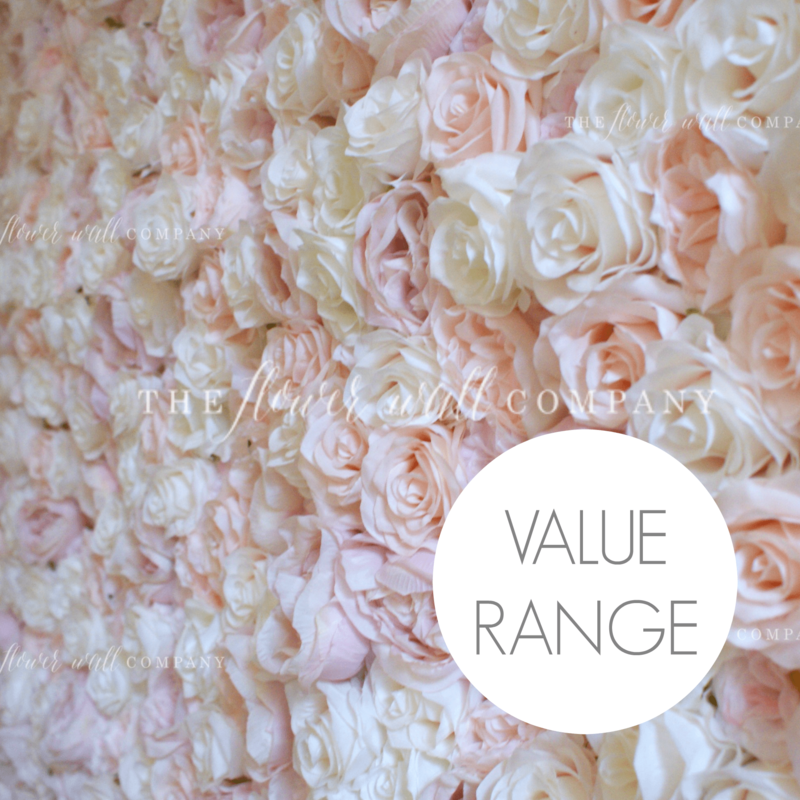 Our Value Flower Wall Range….Cheap or luxury? 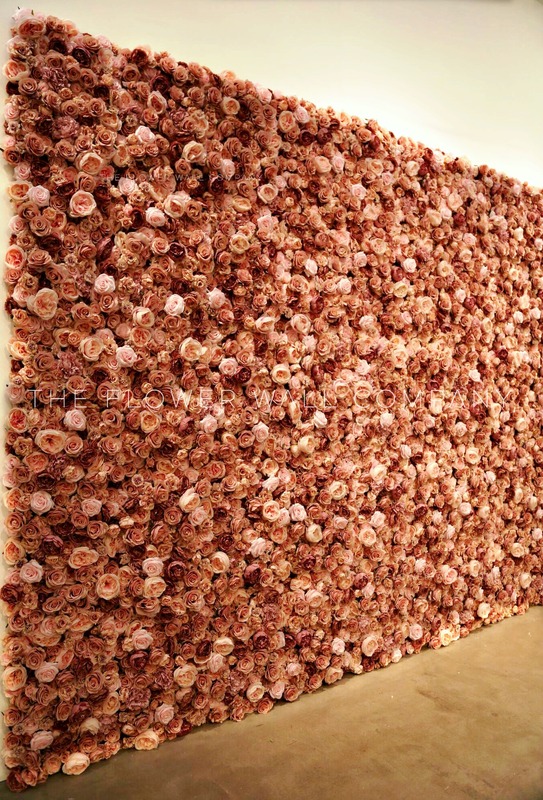 Can a flower wall ever be both? Hmm, we’re not so sure! 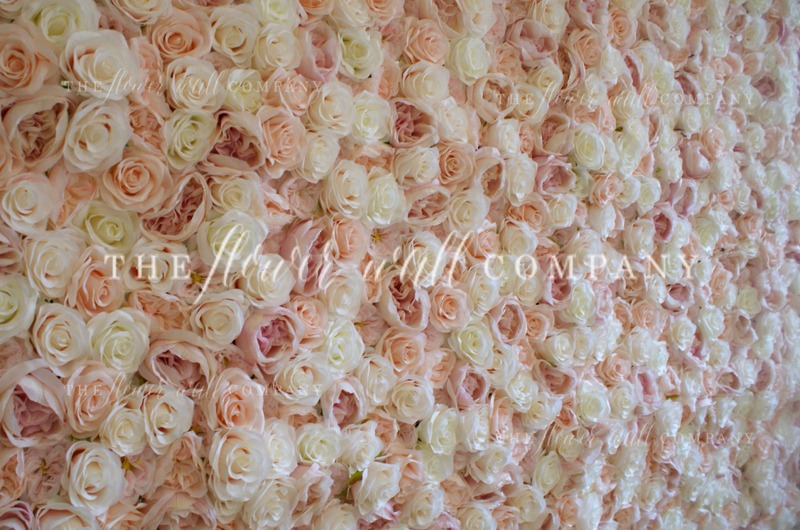 Since we launched our Value Flower Wall Range last month we’ve been super busy with orders from customers who will not only be adding the wall to their portfolio of rentals, but also from private clients who will be using the wall for the own personal use at events such as weddings or baby showers. When prices start from 895USD, we can see why – it’s a competitive price compared to some day rentals! 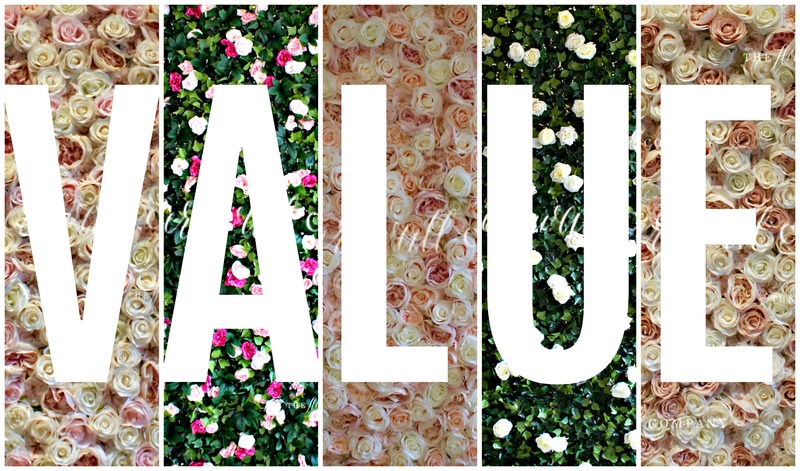 But one thing we can’t help but notice, is how our Value Range looks a lot like what fellow flower wall vendors describe as ‘luxury’ or ‘bespoke’. 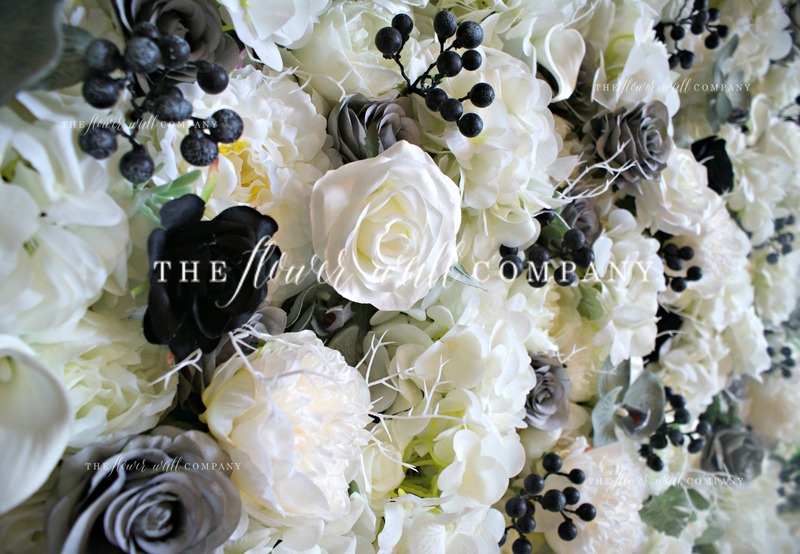 We like to think we’re pretty open and honest at The Flower Wall Company, and we created our Value Range specifically for those brides on a budget who want a flower wall at a lower price, but with our years or experience, we think we are ok to say that as gorgeous as this range is, it isn’t ‘luxury’ or ‘high end’. And there is nothing wrong with that! But let’s be mindful about using those words. We’ve said before luxury is a relative term, but we can’t help but think some other flower walls are being mislabeled and misdescribed. Now that is wrong! Not all flower walls are made equal, designed equal, or look equal, so how can they all be described as luxury, high end, or bespoke? It’s a question we have been pondering recently and will definitely be delving into in the future on this very blog! How do our Value Walls differ from the rest of our range? Most of our other flower walls use at least 10 different types of flowers – some use over 50 separate pieces – that means different species, size, color and material. 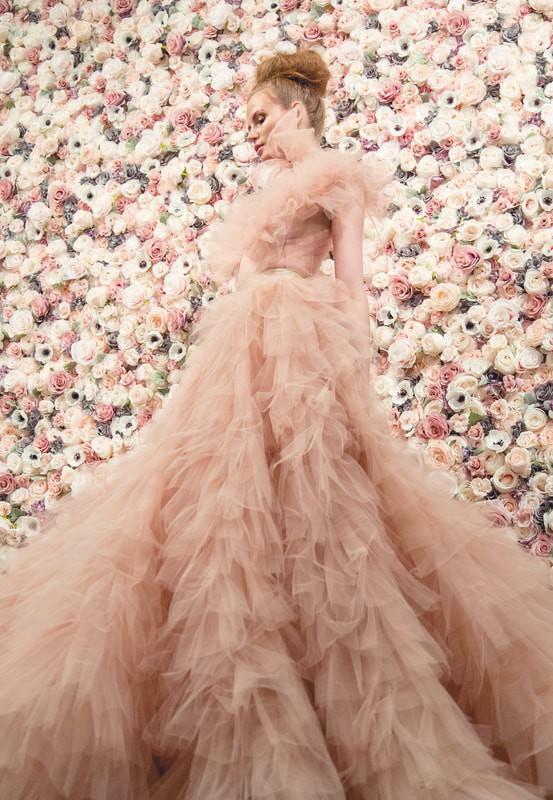 Initially we used so many as we quickly realized that the best flower walls are the ones that look real, and in real life, no two flowers are the same, so we try to replicate that idea in our backdrops. 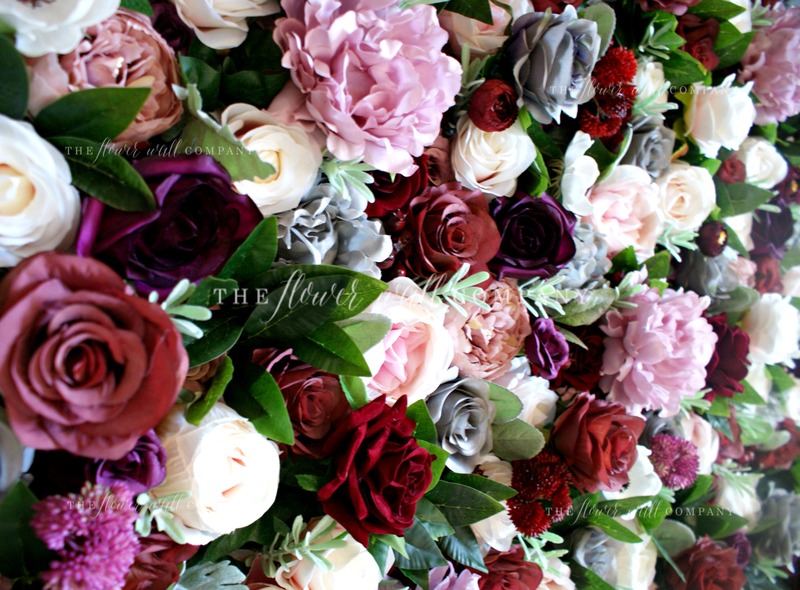 Our Value Range only uses a around 5 different blooms, but what we still do is hand arrange the flowers into a western style arrangement and color scheme, and we still do it in our way that means you can reuse the wall tens if not hundreds of times – we build our walls not to fall apart. Our Value Range is also not 3D as the flowers we use are all similar heights, but the blooms are still high quality imitation florals, and we still use over 100 per panel. We firmly believe the blooms in our Value Range are better quality than some of the other flowers we’ve seen in walls on social media touted as ‘luxury’ – such as the flower wall below. Being in China means we get to see so many new flowers each day, and there are ones we simply refuse to use as they don’t meet our high standards….actually quite a lot are rejected, usually for being low grade material or not well designed. You can see from this image, which is promoted as ‘luxury’ that our Value Range is taking no prisoners when it comes to how amazing it is! We look at flower walls all day every day, so it’s easy for us to see the comparisons and quality. When purchasing online, it can be hard to see the difference of price over value, and a lot of time is probably spent reading the descriptions of products, but we are saying enough with the superlatives! Own the product you sell – we are upfront and honest about our Value Range. 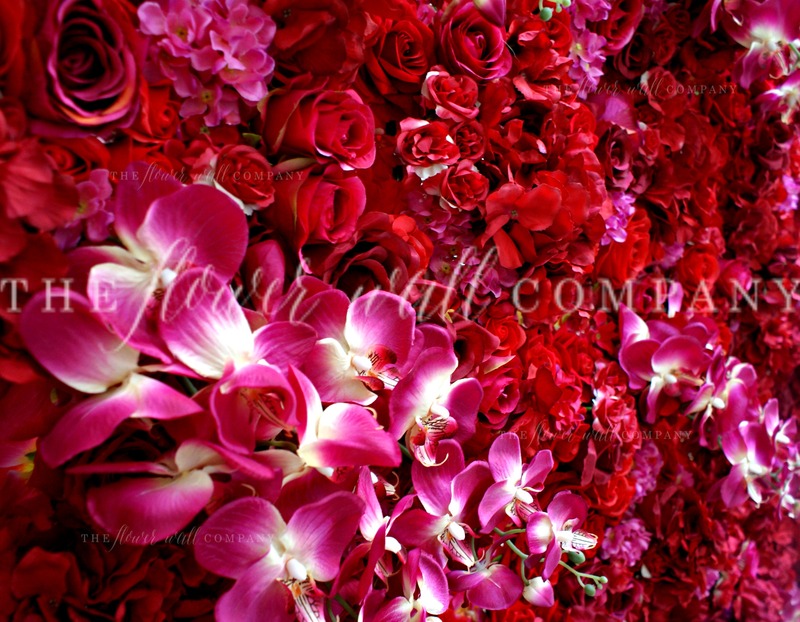 The colors and arrangement are beautiful, but is it as evolved and life like as say our Aninia Flower Wall? No. 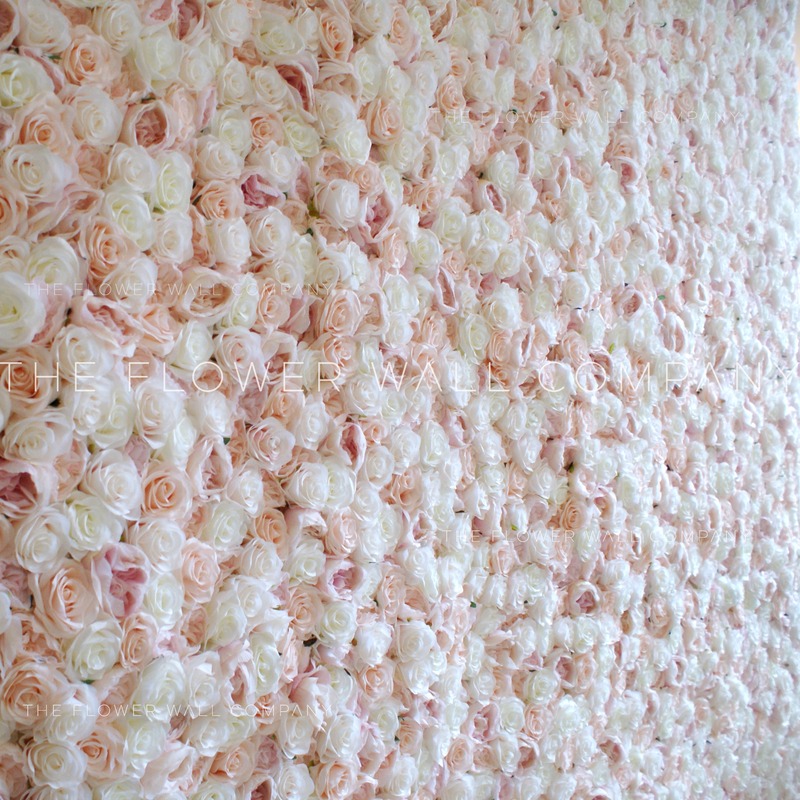 Does it mean a flower wall from our Value Range will look any less stunning at an event? No, not at all. But as everyone has a different amount to spend, we wanted to offer all potential customers a choice and we wanted to show our customers that our Value Range competes directly in price with what other companies call luxurious, but definitely not in style. Our Value Range is light years ahead in that department! 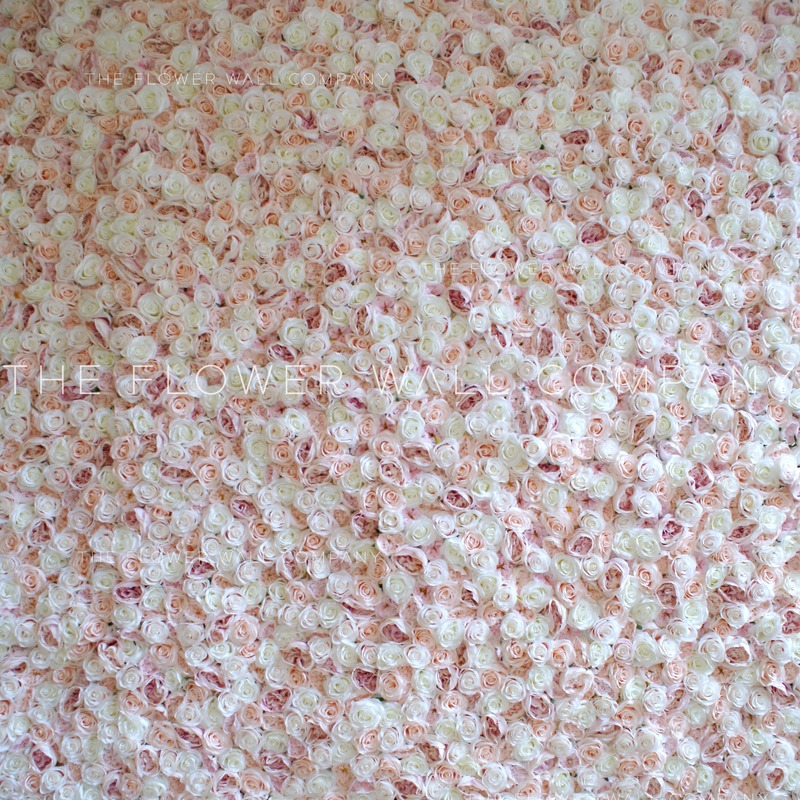 Our Flower Wall Value Range currently has 5 designs, and we planning on adding more soon. Not all flower walls are created equal. 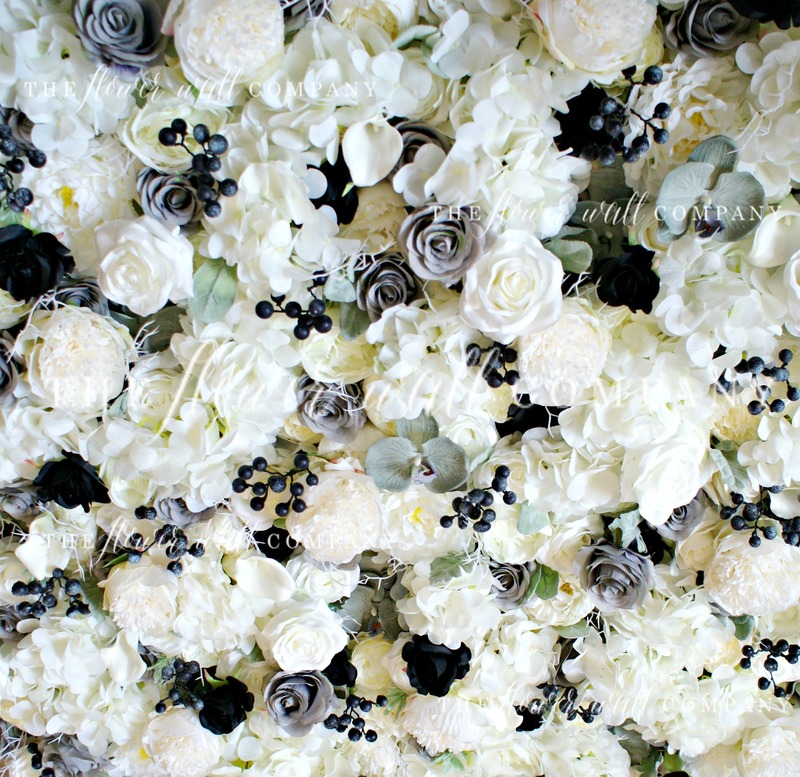 We’ve blogged before about who’s who in the flower wall world and why we are just that little bit different, we even speak about it on our online store – and as we’ve gotten more and more orders for high end floral backdrops, something a client in London said to us really stood out – not all flower walls are created equal! It really resonated with us, as the past year we’ve been working really hard to develop more realistic, wow flower walls to show the expertise, design and skill we put into floral backdrops. 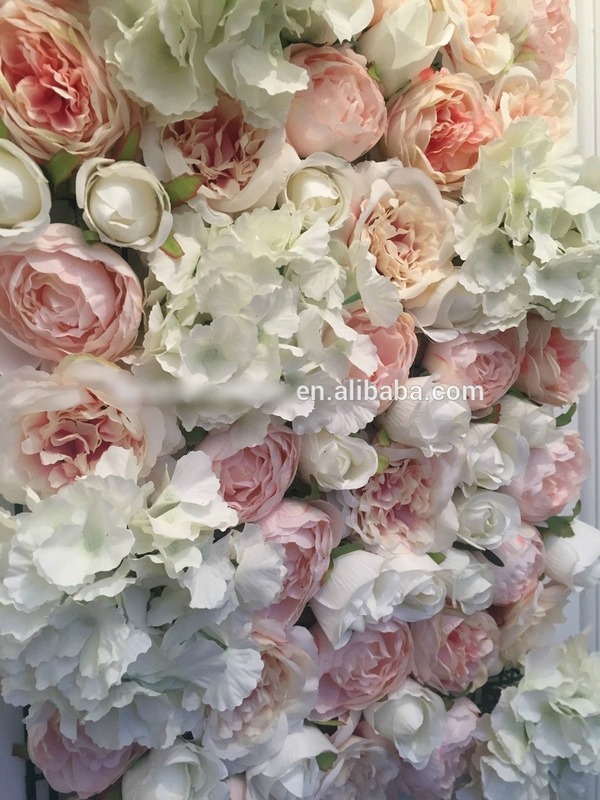 We know budgets and expectations vary from country to country, but we’re really surprised at the increase in the basic flower walls from places like Alibaba being resold as high end, luxury, and even as companies own work. We think the flower wall industry should be moving forward, be more transparent, and of course be moving away from this kind of design. 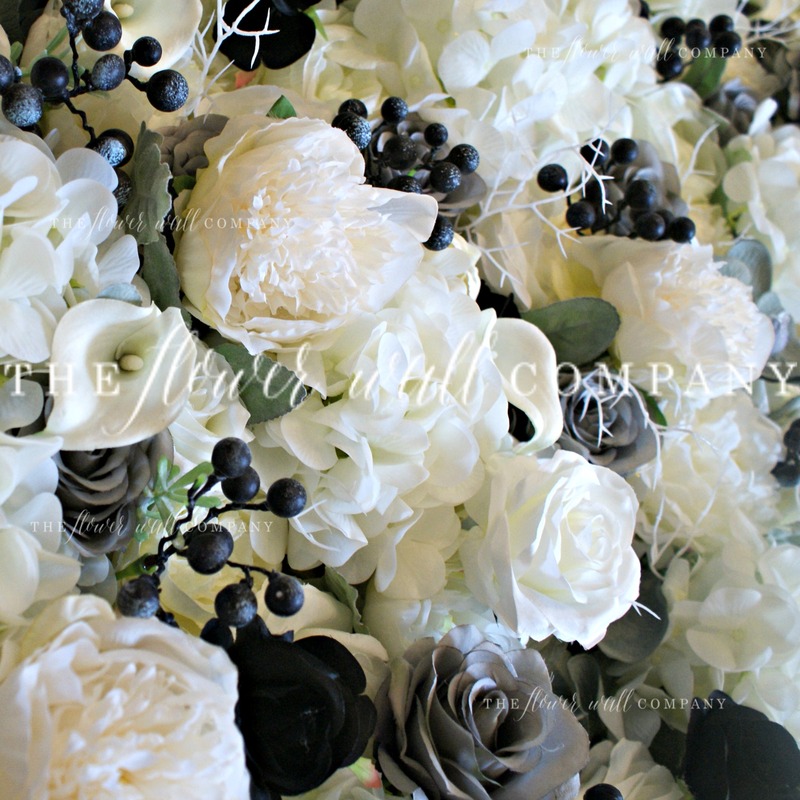 We believe here at The Flower Wall Company we are leading the way in the in depth styling and fast reactions to trends. Even as our Summer Sale kicks off, we are still receiving orders for and creating full price gorgeous flower walls that are totally designed to wow. 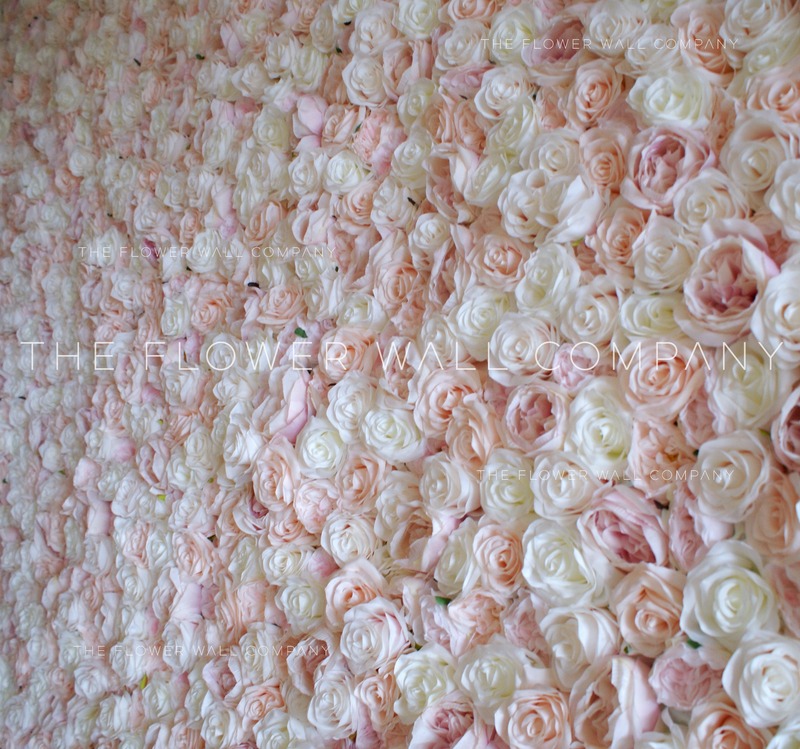 We worked on another Aninia Flower Wall recently, which was actually created as an extension for a customer in Melbourne for their existing Aninia which means Victoria brides and event planners will have an amazing 6m wall to rent. Super lucky if you are in Melbourne! When we posted pictures of this wall to our Facebook page a few weeks ago, we were inundated with messages asking if it was real or not – to us, that is the biggest compliment we can receive! Creating this new style of wall takes experience and passion. We’ve said before we are a small, international team with a background in design and florsitry, and we think that puts us at the forefront to create some of the best quality flower walls you can purchase. We aren’t limited to blooms made by one factory, or playing catch up with designs and quality, we are at the front, pushing our suppliers to create better florals in colors we want. Soon we will be launching our new Autumn/Winter range, and we will definitely be focusing on this sort of style, and we can’t wait to share our new designs with you! Happy July! We can’t believe we are already over half way through the year, where has the time gone? You’d maybe think in the middle of summer we would be focusing on bright colors, but for our July Flower Wall of the Month, we have begun to incorporate the Fall & Winter colors that will be on trend this season. It’s around this time our lovely corporate, hotel, fashion and retail clients start to place their orders for their autumn/winter backdrops, so we decided to create something for our private and small business customers that is in a similar styling and color scheme so everyone can indulge in the beautiful color schemes of the moment. According to wedding giant The Knot, one of the major color combos this year will be Frost, Blush and Boysenberry. 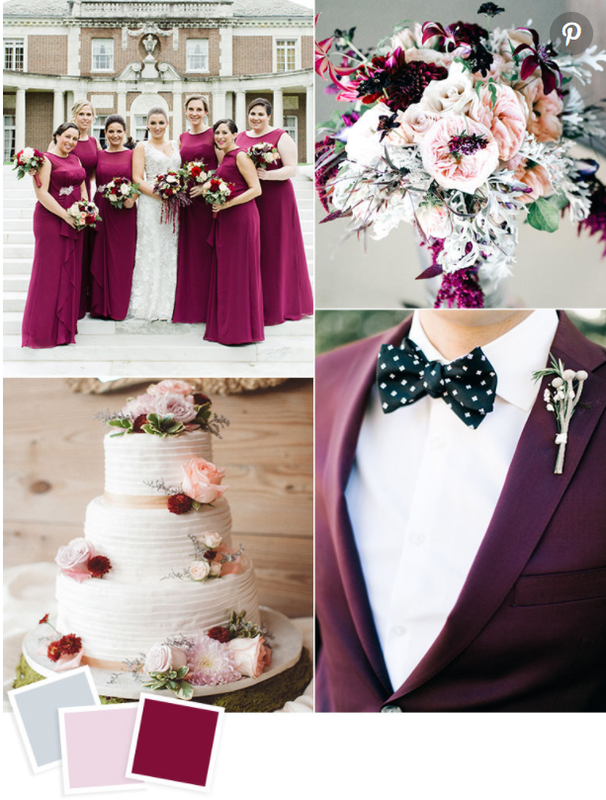 Blush is a super versatile color no matter the season for events or weddings, but we love the addition of frost and boysenberry. Classy, regal colors that also look super modern and fresh. 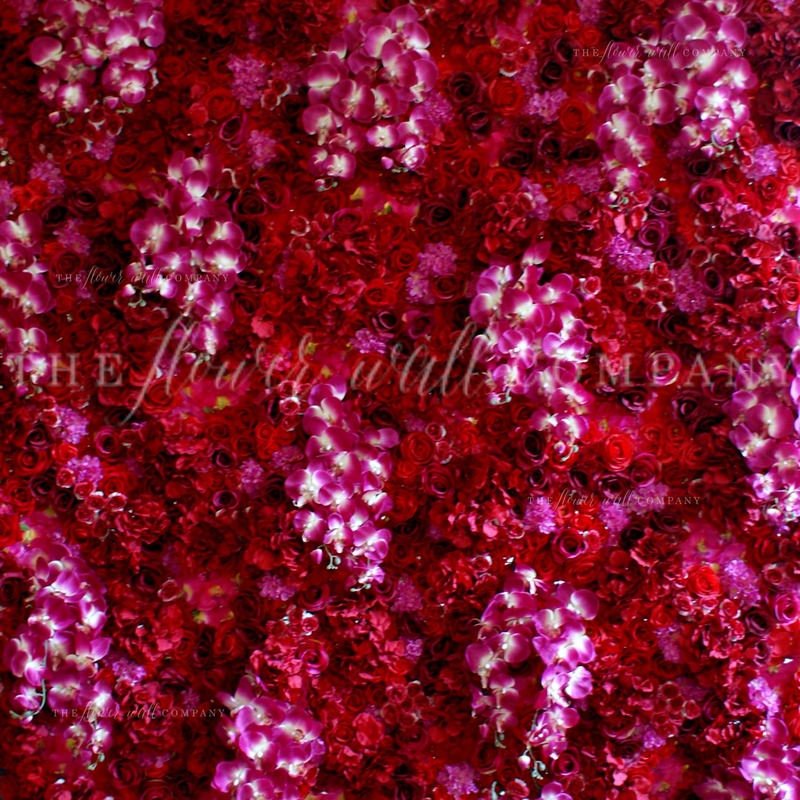 So with this stunning color palette in mind, we have created our July Flower Wall of the Month! Our Flower Wall of the Month promotion is a fantastic opportunity to purchase a floral backdrop with a discount and we try to vary the color and styling each month to keep giving you something fresh and interesting to add to your rental portfolio. Our latest creation, with an amazing 20% off for the month of July is a gorgeous blush, grey, pink, and wine red color mix with real touch succulents and foliage. Over 25 different pieces are in this design, from small 1cm succulents, to big roses to statement dahlias and you have an elegant, on trend flower wall. We love the deep wine red and purple colors of this wall that sit perfectly next to the blush and grays. Super unique and on trend for Fall/Winter 2017/18. We’ve not seen a styling like this anywhere else and are proud to debut this design, we are totally in love! As always we focus on high end replica walls, but our Luxe Range takes this to a new level. 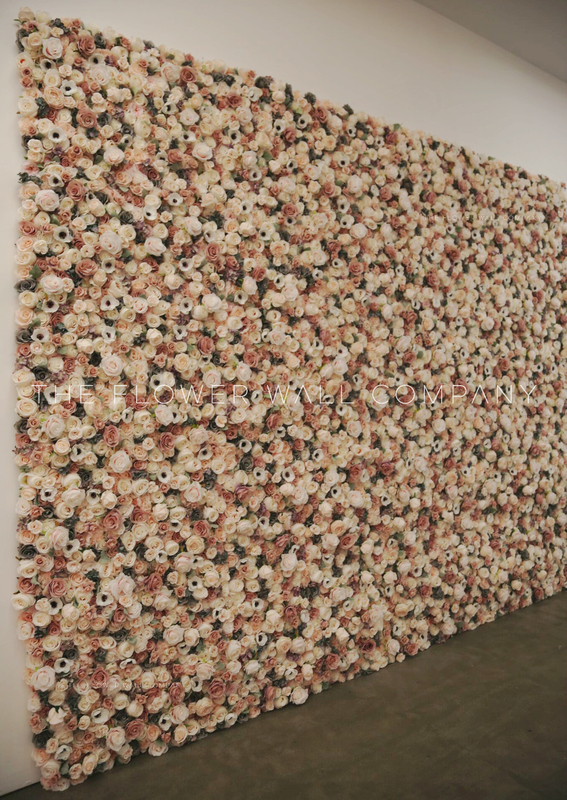 The flowers are all at different heights, creating an ultra 3D wall which only adds to it’s life like aesthetic. The handiwork and attention detail, as well as the high end replica blooms are what elevates this floral backdrop to a Luxe Wall. As we always say, we don’t resell mass produced flower walls under the guise of doing it ourselves, we are creating these beautiful backdrops in our workshop using the only the best flowers for budgets and taste. 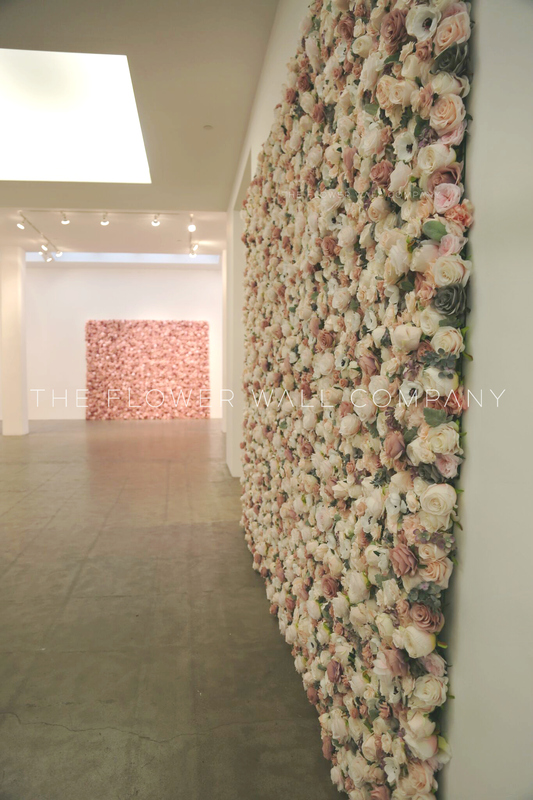 This wall is available to purchase here, or if it’s not quite what you are looking for, simply drop us an email with your requirements info@theflowerwallcompany.com or browse our online store for more inspo. Don’t get us wrong, we love creating cream and blush flower walls, but sometimes you need a little color to spice up weddings and events, and what more perfect way to do that than with our Miss Ruby Flower Wall. What we love about Miss Ruby is the intricate detailing and multi layered effect that comes from using over 25 different kinds of flower. We’ve proudly said before that we are not a factory, nor do we use the low quality blooms from Chinese e-commerce wholesale sites. 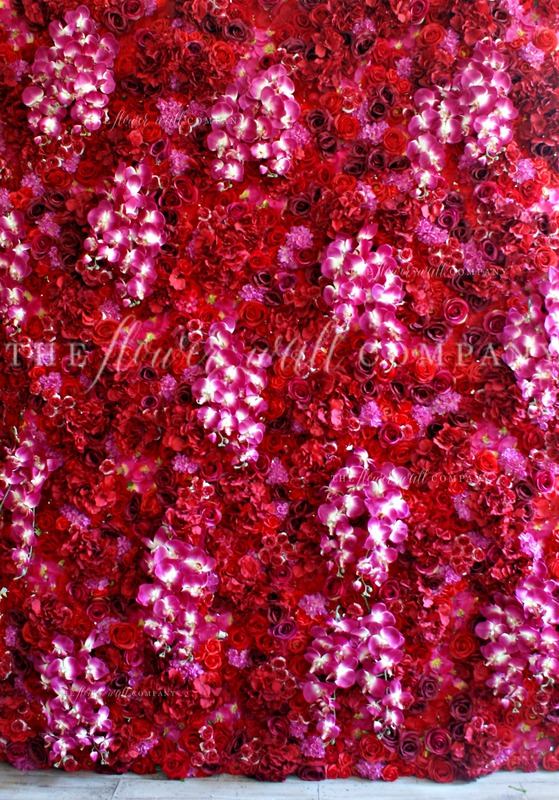 We hand select pieces from over 15 different suppliers to create stunning, realistic looking flower walls. 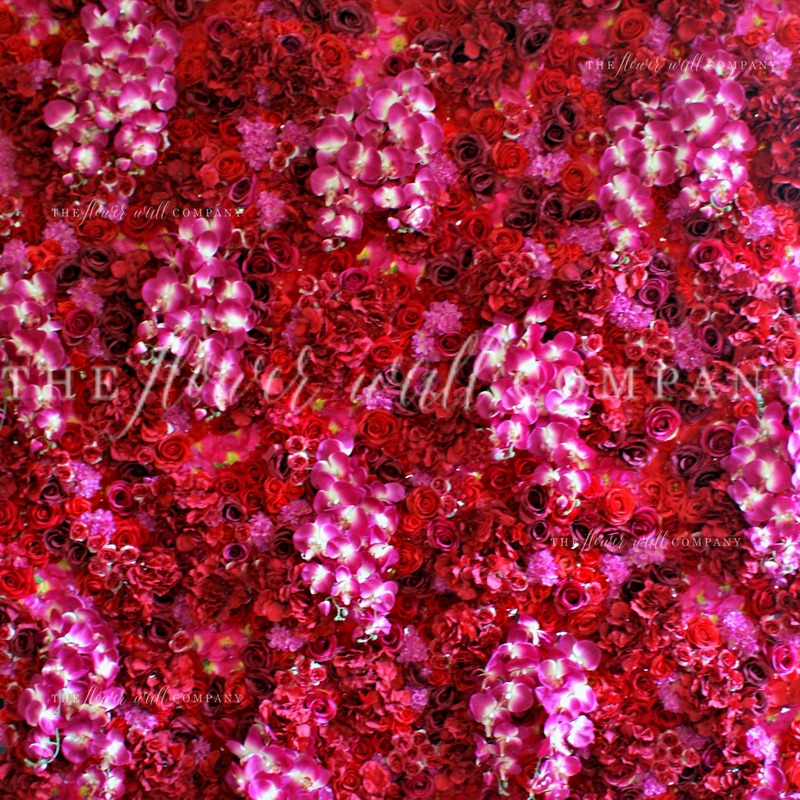 We don’t outsource, we don’t resell, we create these beautiful floral backdrops in our workshop. We love the magenta hanging orchids in this flower wall, they sit perfectly in contrast to the strong reds in roses and hydrangea behind it. Red can be tricky to photograph, but with the right camera and expertise you can highlight all of the gorgeous flowers that have gone in to this wall. We can’t wait to see this Miss Ruby Flower Wall in action and all of the gorgeous images that come with it! Miss Ruby is available to purchase directly on our online store in our three most popular sizes, or you can purchase a sample for a small fee. As always we accept custom size requests, simply drop us an email with your requirements and we will be happy to provide you with a quotation! A Flower Wall for a good cause – 2017 Spirit Of Life Award Luncheon & Fashion Show. This past week we were happy to see a gorgeous flower wall created by us in use at the 2017 Spirit Of Life Award Luncheon & Fashion Show which is a fantastic cause to raise awareness and funds for City of Hope, an independent research and treatment center for cancer, diabetes, and other life-threatening diseases. In attendance were over 400 guests, many from the NYC society circuit and supporters of City of Hope, as well as some famous faces from the world of fashion, beauty and social media. We’ve loved looking at the stunning pix at this amazing event! We created this custom wall as a variation on our Petra Flower Wall by adding in more pastel purples and pinks whilst removing more of the grey-lilac and mint tones. 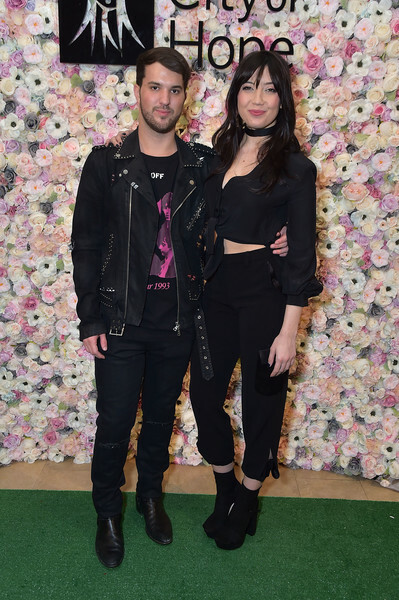 Andrew Warren and Daisy Lowe attend the 2017 Spirit Of Life Award Luncheon & Fashion Show at The Plaza Hotel on May 8, 2017 in New York City. Founded in 1913, the City of Hope Foundation is one of 47 comprehensive cancer centers in the United States, as designated by the National Cancer Institute, that focuses on independent research and treatment in order to help those that suffer from cancer, diabetes, and other serious life-threatening diseases, so we are truly honored to have been part of the event. 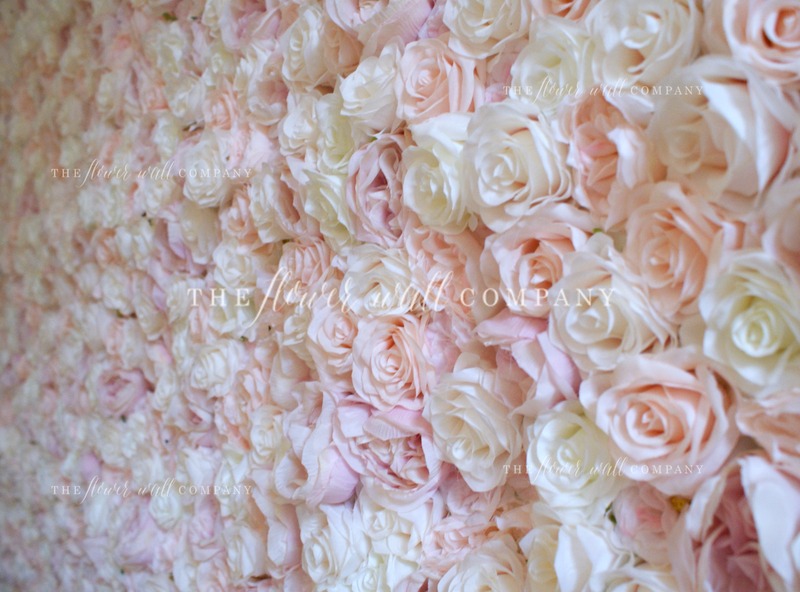 The original version of this wall, Petra, is currently our Flower Wall of the Month and for the month of May you can purchase the Petra design with a 500USD discount meaning you too can have a wow wall for any wedding or event.